A tent city is rising near Allahabad, India, at the confluence of three of the country’s holiest rivers: the Ganges, Yamuna and Saraswati. 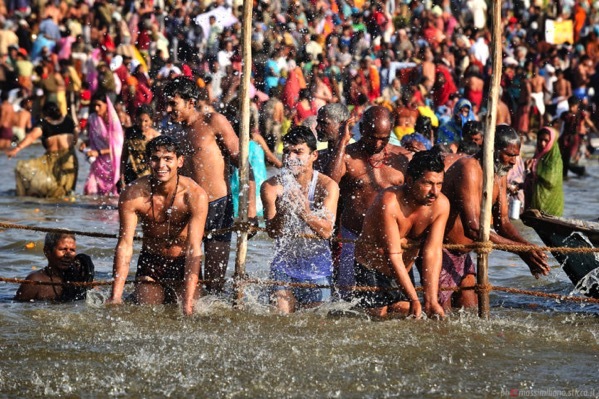 Complete with running water and sparkling LED lights, the city will accommodate 150 million pilgrims — a crowd equivalent to nearly half the population of the United States — next February for the Kumbh Mela, the world’s largest bathing event. But some experts worry that the iconic religious festival poses a major health concern. The last major gathering in 2015 altered the bacterial population of the Godavari River, increased the risk of waterborne disease outbreak and introduced drug-resistant “superbugs” according to a study published in October in Microbial Ecology. This is not the first time the festival spurs health concerns. Experts have long recognized it as a major cause of cholera epidemics during the 18th and 19th centuries. Researchers saw a 130-fold increase in the total number of bacteria following the festival. They also discovered that most of the naturally occurring bacteria in the river were replaced by microbes usually found in human skin and feces. There were also elevated levels of pathogens that cause salmonella, whooping cough, staph infections and tuberculosis. Water is an open system. If the water is not treated, it goes to different areas, which may lead to bacteria swapping genetic material with one another without reproducing — that process is known to speed the proliferation of drug-resistant strains of bacteria. This could lead to antibiotic resistance spreading downstream through the river. This entry was posted in Disease and tagged disease outbreak, India, Infectious Diseases. Bookmark the permalink.